We're pleased to announce that the West Jefferson Revitalization is the winner of our Strongest Infrastructure Project contest. This downtown redesign effort received the most votes last week. 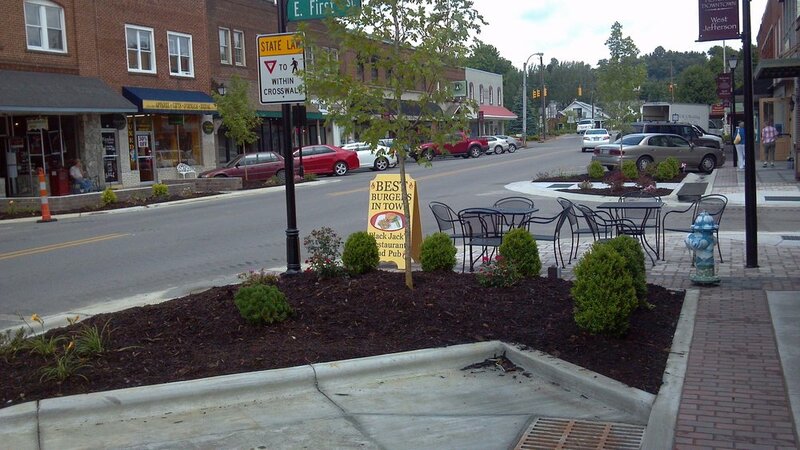 This project was undertaken by a public-private partnership in the city of West Jefferson, NC. When the NCDOT announced the resurfacing of Jefferson Ave in 2010/2011, the city decided to use it as an opportunity to revitalize a neglected commercial area, fulfilling a long-held desire that the community had expressed during a public charrette in 2002, aided by North Carolina State University. 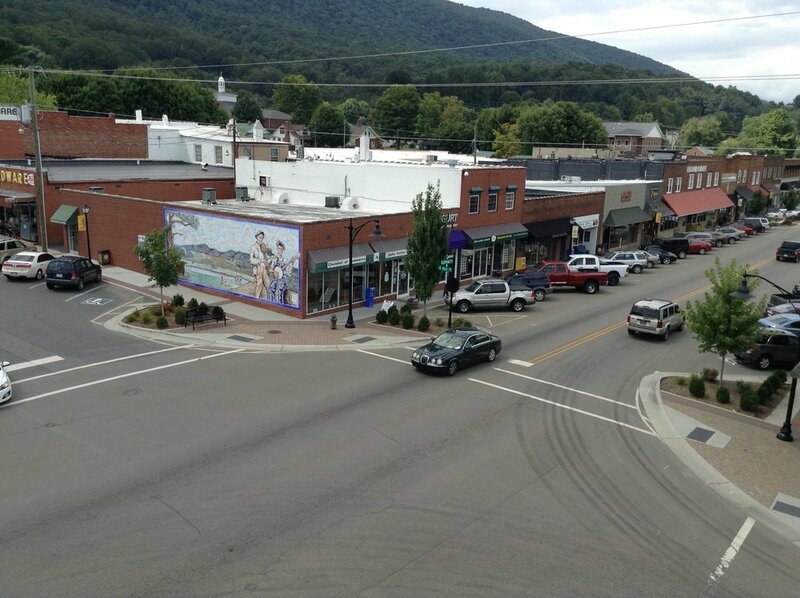 "The Town partnered with NCDOT, McGill Associates, Blue Ridge Electric Co-op, & Appalachian District Health Department to design a downtown that would be a pedestrian friendly and walkable downtown," explains the initial project nomination, submitted by Brantley Price, Town Manager of West Jefferson. The revitalization of this area involved removing overheard power-lines and replacing traffic lights with stop signs, bumping out curbs for increased walkability and doing landscaping along the street. The town also "used a program developed by local Arts Council Director Jane Lonon called the 'Empty Window's Project' where local art was placed in empty storefronts," explains the project nomination form. 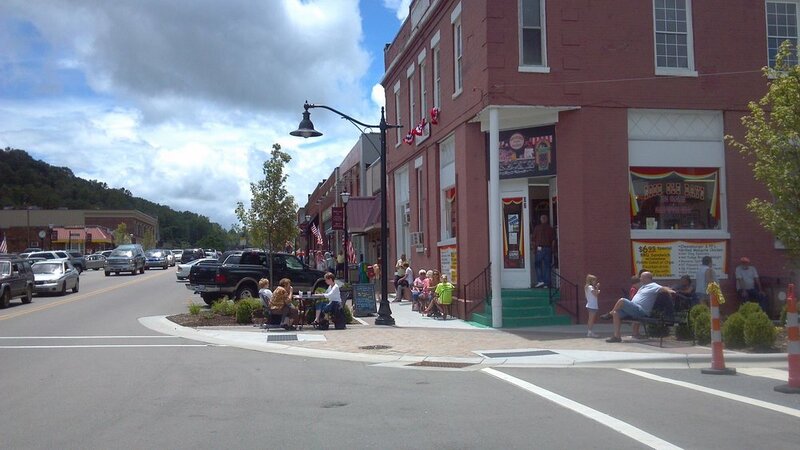 Today, West Jefferson has zero empty storefronts. As a result of increased pedestrian activity on the street, many local business owners have also been inspired to renovate and beautify their existing storefronts. We chatted with Brantley Price, the town manager and Dean Ledbetter of the North Carolina Department of Transportation to learn a little more about this project. Brantley explained that Jefferson Avenue is actually a state-owned street and when the city learned that it was going to be repaved, "The mayor and myself met with DOT to see whether we could do some curb extensions that were shown in our charrette." The city wanted to make some design changes on the street, and the DOT wanted to remove traffic signals to save money on maintenance costs. "We were wasting money maintaining traffic signals that weren’t helping anybody," Ledbetter explained. That desire to remove the traffic signals sparked this revitalization of Jefferson Avenue, which allowed both parties to achieve their goals. The biggest benefit? Increased economic activity in the town. "It’s slower, it’s quieter, and people find it easier to cross the street," Ledbetter explained. While there was initial resistance to change among some business owners, Ledbetter said, "All of sudden people became advocates for something they thought they would oppose." 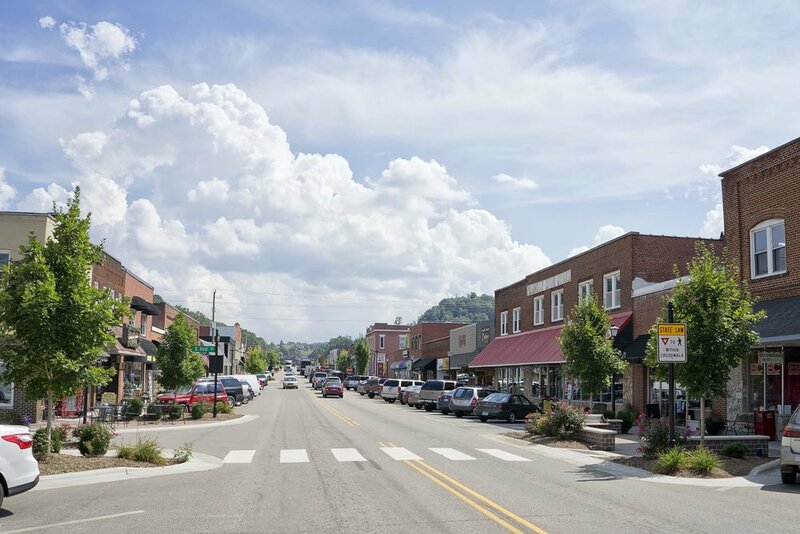 When asked about the positive impacts of this project on the town of West Jefferson, Price explained that the number one impact is "the economic vitality of it. We had empty buildings [before], and we did not go out and try to find these businesses. They just came and they filled our buildings." As a result of Jefferson Avenue's redesign, Price says, cars drive slower which means drivers and passengers are more likely to notice local businesses. Pedestrian activity has also increased tremendously as a result of the streetscape redesign for better walkability. For a state that has seen some of the highest pedestrian fatalities in the country, this is especially significant. Price stated that the redesign has been a boon for both tourism and local economic activity: "It’s really increased our tourism, but you wouldn’t believe how the locals love it." The state DOT is now looking at implementing similar projects in other towns in North Carolina and has already removed 10% of traffic lights in the eight-county area of northwest North Carolina. Strong Towns readers and members who voted for this project were, no doubt impressed by this neighborhood-scale effort to make a downtown street safer, more walkable and more attractive, which is clearly having an impact on the life and economic activity of the city. Well done, West Jefferson! At Strong Towns, we believe that a nation full of towns that take on small, incremental projects to improve their neighborhoods is a much better model than a nation where the federal government goes trillions of dollars in debt in the hopes of growing the economy through megaprojects. The redesign in West Jefferson is a superb example of this. You can read all of the inspiring projects selected for the final phase of this contest here. We also invite you to be part of our ongoing conversation about infrastructure spending in America.